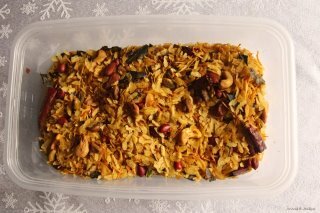 Arvind Mallya's Bhajjilo Phov (Fried Poha) using lot of nuts like peanuts, cashew, almonds and pistacho. Yummy!!! As soon as I saw this picture and read the post in Konkani Coastal Cuisine & Beverages on Face Book, I remembered that every time I tried to do a shallow fried chivda in a microwave I ended up with the phov not being crispy like the deep fried one. After trying two or three times I gave up on microwave method and resorted making chivda only during Diwali festival as we get the bhatti roasted puffed up phov only during Diwali. I used to shallow fry this and keep it aside along with other chivda ingredients heat up a tablespoon oil (for one kg of phov) and after tempering with mustard seeds, green chillies, asafoetida i used to just mix up all the ingredients and make a healthy chivda for the family. Add a cup of thin poha into a microwave-safe bowl. Microwave it for 1 minute. Give a good mix and again microwave it for a minute. The poha should by crispy and crunchy. Keep it aside. Add half a tsp of salt in a motar and crush it to a fine powder with the help of a pestle. Keep it aside. Heat 1 1/2 tsp of oil in a pan. Turn the heat to medium. Add 1/2 a tsp of mustard seeds,Curry leaves,Red chilly and let them splutter. Add a tblsn of peanuts and fry till done half. Add 3 tblsn of dalia, curry leaves and 3/4 th of crushed salt too. Add a big pinch (half of the 1/4 tsp) to the pan. Stirfry for a while. Stirfry for 2 minutes till the turmeric is well coated to the poha. Heat oil for tempering, after spluttering tempering ingredients then add nuts and the phov after sauteing for 5 to 10 minutes. Spread the still soft in a cookie pan and bake oven at 350F/ 180C degrees for 30 min. Crispy healthy oven roasted chivda ready. Beaten rice flakes or poha is obtained by pounding treated rice with a iron pounder so rich in iron! Traditionally every konkani household used to have a iron wok or kaili alongwith other brass vessels may be they used iron wok to add iron content to the food.